According to the Old Testament, God created heaven and earth in six busy days. However, on the seventh day He rested from his work, and the Fourth commandment instructs people to do the same; believers nor their family, servants, cattle or even “strangers within their gates” should work on that day. The Quran does not mention any specific day for resting from work. Although Allah also used six days to create the world, on the seventh He “established himself above the Throne” – business as usual here. Blissfully, He made the night a covering for His followers to sleep and rest in. Nonbelievers need not worry. In the absence of sacred texts telling them when to rest from work and that work and rest should be alternated, a large body of scientific research has considered the balance between work, work effort and working hours on the one hand, and rest breaks (varying from very short micro-breaks during work to multi-week holidays) on the other. The effects of (disruptions of) this balance have been examined in terms of a wide variety of outcomes such as stress, fatigue, motivation, work performance, sickness absence and burnout, and errors and accidents at work, showing that sufficient recovery from work effort is needed to obtain favourable work outcomes such as high performance and high well-being. This may seem a trivial insight, and in some ways, it is. For example, the importance of starting a task well-rested was already acknowledged by general Julius Caesar at the battle of Pharsalus in 48 bc. In what was to become the decisive battle in the Roman civil war, Caesar’s troops were greatly outnumbered by those of his opponent Pompey the Great. There was much space left between the lines of the two hostile armies. Cleverly, Pompey had ordered his troops to await the attack, trusting that Caesar’s soldiers, after running over double the usual ground, would become “weary and exhausted” by the fatigue and would be easier to defeat. However, when Caesar’s men noted that their adversaries did not run to meet their charge, they “repressed their speed and halted almost midway so that they would not come up with the enemy when their strength was exhausted”. After a short respite they renewed their course. Due to their greater experience and Caesar’s superior strategic skills, a huge victory followed, essentially ending the civil war. Briefly afterwards, the Roman senate appointed Caesar dictator for ten years. The rest is history. Clearly, the idea that a world can be won by taking your rest breaks at the right time was not unknown to Caesar and his fellow men. However, the idea that people – soldiers as well as factory workers – must rest at certain intervals to perform optimally had largely disappeared when the industrial revolution took off. Indeed, one of Frederick Taylor’s contributions to the organization of modern working life was his observation that workers produced more when they took short breaks from work at certain intervals. This idea was taken further by Lillian and Frank Gilbreth, who devised complicated work/ rest schedules, assuming that short and frequent breaks were more beneficial than longer, infrequent breaks. Basically, their assumption was that work performance will improve if workers have opportunities to recover from the effort they expend in completing their tasks. That sounds reasonable, but is it true? A central concept in the literature on work hours and its consequences is that of long working hours. In many Western countries, a regular work week refers to working for on average 32 to 40 hours. For example, in 2015, workers in the European Union worked for on average 36.1 hours per week, with a corresponding figure of 38.6 hours per week for Americans. “Working long hours” refers to a situation in which people work more hours than is widely accepted as being within reasonable bounds, for example the research office of the European Union considers people who on average work longer than 48 hours per week as working long hours. Note that these figures do not include entrepreneurs and small business owners, as these groups decide for themselves how many hours they work, contingent upon their situation and ambition. This does not mean that members of this group always work long hours. For example, the owner of my local guitar store is a former top-level executive of a major international IT corporation who – after accepting a liberal buyout offer – decided to spend more time with his wife, family and hobbies (building and playing guitars, obviously). He now works 4 days a week, some 30 hours in total, and would not dream of going back to his old working schedule as a successful top manager. Working long hours has a bad reputation in terms of its possible consequences for health, performance and well-being. The evidence as to whether that reputation is deserved is somewhat mixed. For example, a Chinese study found that participants who worked more than 60 hours per week were 1.75 to as much as 5.2 times as likely to report burnout symptoms than participants who worked 40 hours per week or fewer. A review paper of 25 large-scale studies involving data from more than 600,000 participants showed that the risk for individuals who work long hours (55 hours per week or more) for coronary heart disease was 13 per cent higher than that for those working standard working hours; the risk for obtaining a stroke was 33 per cent higher. Another review study defined “long working hours” as working on average more than 8 hours per work day, finding that long working hours were associated with a higher risk of depression, anxiety, sleep problems and cardiovascular disease. A study from down under reported that 13.4 per cent of Australian nurses and midwives engaged in harmful daily drinking, and that the risk of doing so was elevated by 17 per cent for those who worked 50 hours or more per week. Simon Folkard and David Lombardi combined the findings of several studies on the relationship between accidents at work (including injuries and fatal accidents), showing that after having been 10 hours on the job or more, the risk for workers to be involved in such accidents doubled (for 10 hours) or even tripled (for 12 hours and more) after having been relatively low for the first 8 hours of their work shift. Finally, writing in 2015, economist John Pencavel from Stanford University reported that the relationship between working hours and output was non-linear. Using data from British munition workers (mostly women, so-called “munitionettes”) who were remunerated on the basis of a piece-rate system during World War I, Pencavel found that below a threshold of 49 hours per week, overall productivity was proportional to the number of hours worked on a day. However, above that threshold, the output per hour fell as the number of hours worked increased. Working longer hours still led to an increase of production numbers (more bullets, bombs and grenades to kill the enemy with), but with decreasing efficiency (workers needed increasingly more time to produce each piece of ammunition). Indeed, the total output after 70 hours of work differed little from the output at 56 hours of work. Apparently there is no point in staying longer on the job. Of course, these estimates are limited in their scope (the jobs in a World War I munition plant are very different from most of today’s jobs), but they do show a clear correlation between output and working hours. All this sounds pretty decisive: working longer hours is associated with lower levels of well-being and health (burnout, depression, anxiety, sleep problems, cardiovascular disease), suboptimal behavioural patterns (e.g. drinking), higher injury and accident rates at work and a decreasing efficiency of production. It might therefore be concluded that working long hours has mainly negative consequences for workers and the organizations they work for. However, that conclusion has been challenged for three reasons. First, studies on the associations between working long hours and outcomes could not always unambiguously distinguish between “cause” and “effect”. That is, working long hours may well lead to ill-health, but it would also seem likely for physically and/or mentally less healthy workers to restrict their number of working hours. In both cases, a positive association between the number of working hours and worker health will be observed, but it is difficult to say which interpretation it supports. Second, the associations between the number of hours worked and the presumed outcomes thereof may be statistically significant but can still be practically irrelevant. For instance, the chances of being involved in an accident at work may be three times higher for those working hours as compared with those working 8 hours per day, but since the chances to be involved in such accidents are low in the first place, few will (should?) care about tripling these chances. Finally, the associations between long working hours and outcomes tend to differ for male versus female workers, older versus younger workers, workers having well-designed and pleasurable jobs versus other workers, et cetera. For some groups, the adverse effects of working long hours may be considerable, but this may be different for other groups. Apparently, the adverse effects of long working hours are “nuanced”, and more research is needed to obtain a fuller understanding of these effects. All the same, in many countries, policy makers have decided to err on the safe side, implementing legislation intended to put a maximum to employees’ working hours (again, the working hours of self-employed and entrepreneurs are usually not covered by such legislation). Effects may be weak, but each work-related injury, accident or spell of sickness absence that is prevented is one more happy worker, one less claim for medical insurance, et cetera – you will get the point. Even if the deleterious effects of working long hours to health and well-being would be nuanced, it is important to know about the processes that might account for these effects, as this may provide practical handles for addressing possible problems. In psychology, many studies on the effects of long working hours and its outcomes focus on the balance between work effort in general (i.e. not necessarily long working hours) and recovery from that effort. In an influential paper, Dutch psychologists Theo Meijman and Gijsbertus Mulder argued that working unavoidably coincides with effort expenditure: to achieve something at work, you must put your time, motivation and skills in it. This results in an activation of the sympathetic nervous system; this system kicks into action during emergencies (or what the worker subconsciously perceives as an emergency, such as a dissatisfied customer, an evaluation talk with the boss, an assignment that is past its deadline, et cetera) and mobilizes the organism to respond to this stressor. By releasing the hormones adrenaline and noradrenaline, it contributes to increased heart rate, blood pressure, muscle strength, mental activity and total energy consumption (which ultimately results in fatigue). When the emergency is past, direct response to the stressor is no longer needed and the parasympathetic nervous system takes over: the organism returns to a quiet and relaxed state that helps in restoring the undesirable and destructive effects of the activation of the sympathetic nervous system. Blood pressure drops, heart rate slows down and energy is restored rather than consumed. The essence of recovery is that the psychophysiological systems that were activated during work return and stabilize to a baseline level in which no special demands are made on the individual. Lots of jargon here (apologies for that). Fortunately the basic idea is simple: working induces all sorts of physiological and mental reactions, and these must be compensated for by sufficient opportunities for recovery. Now imagine what happens when workers work long hours. On the one hand, this results in a longer exposure to work stressors (More assignments to be completed! More angry customers to be handled! More deadlines to be met!). Indeed, in itself, working long hours will often already be a response to a stressful situation at work, especially a shortage of competent staff. On the other hand, working long hours implies that there is less opportunity for recovery: work more hours, and there will be less time left for leisure and relaxation. Importantly, the negative effects of lack of recovery after an exhausting day at work may carry over to the following work day. A worker who has not fully recovered from the previous day must expend “compensatory effort” (i.e. work extra hard) to perform adequately the next day. For example, in the 2017 edition of the Tour de France (the prestigious annual multi-stage cycling race), the cyclists finishing first and second in the difficult and exhausting eighth stage (the Frenchman Lilian Calmejane and Robert Gesink from the Netherlands, respectively) did not do as well the next day. In the ninth stage, Calmejane finished only 121st (out of 181 participants), while Gesink had a silly accident within 10 kilometres after the start of the stage and had to abandon the race (fatigued people tend to have more accidents than others). As the Tour is extremely challenging, both cyclists may have been unable to mobilize the effort needed to continue to perform well after their exceptional achievement of the previous day. After having completed eight demanding stages of the race, their energy resources were simply fully depleted and just one night of recovery was insufficient to resolve this issue. In the work context, no real issues will occur if people engage in working long hours only now and then, but habitually working such hours will ultimately result in poor health due to lack of recovery (e.g. burnout, cardiovascular complaints). Evidence for this reasoning was already presented in the previous section, showing that long working hours are associated with adverse outcomes. Essentially, effort-recovery theory holds that there is nothing wrong with working hard, as long as there is sufficient opportunity to recover. These recovery opportunities may take on various forms. For example, workers may recover during the work day by taking breaks or by alternating demanding with less demanding tasks. Evidently, this will be more convenient when their job provides them with high levels of job control and variety (see Chapter 4). Recovery may also occur after work, during weekends and during longer periods of respite such as vacations. What do we know about these recovery opportunities and their effectiveness? As said in the introduction to this chapter, early experts on the organization of working life such as Frederick Taylor and the Gilbreths were already familiar with the idea that optimal work performance required that workers must be allowed to take frequent breaks to perform optimally. Actually, Taylor and the Gilbreths did not so much as to allow but rather forced workers to take breaks, for example, by shutting down assembly lines at given intervals or by leaving blank sections on the conveyor belt, where no product to be handled by the workers was placed. More modern approaches give workers at least some say in when breaks are taken and (within certain limits) how long these breaks are. For instance, take regular coffee and lunch breaks. In many occupations, workers (especially in professional jobs) have some influence as to the scheduling of such breaks. Some workers may prefer to have lunch behind their computer screen, others go for a walk, yet others have complete freedom in taking breaks as they work from home. Philip Tucker from Swansea University, Wales, conducted a literature review that demonstrated that rest breaks are indeed effective in managing fatigue and maintaining performance. He studied breaks ranging from 5 minutes to a full hour. Rest breaks were most effective if workers used that time to take a short nap (less than 15 minutes) and drank caffeinated coffee afterwards (two regular cups of coffee suffice). Perhaps not surprisingly, short naps were especially effective during night work. The length of the break seems to be irrelevant, perhaps because the optimal length of a break also depends on the task under consideration. Finally, Tucker recommends that workers should be allowed to take rest at the point where they experience heightened fatigue – something that only they themselves can decide upon. In this sense, self-scheduled breaks are more effective than organization-scheduled breaks. In a study among hospitalized workers with severe work-related hand injury in the People’s Republic of China, David Lombardi and his colleagues found that the workers who did not take any breaks had been injured after having been on the job for on average two hours. However, the time-to-injury was on average six hours for the workers who had taken breaks – a major difference that shows that not taking breaks may increase the risk of being involved in a work-related accident. As in Tucker’s study, the length of the break was irrelevant. If the length of a rest break is irrelevant for its effects on recovery, why not schedule many very short breaks during the work day rather than just a smaller number of longer breaks? Indeed, such short breaks (of, say, a few minutes at most) may occur spontaneously, for example when workers must switch from one task to another. Workers may also consciously engage in brief non-work activities, for example when daydreaming, drinking a cup of coffee, having a non-work-related chat with a colleague or by checking one’s Facebook page. Although such activities are usually not endorsed by organizations, they may help in recovering from work effort. Research on such micro-breaks has shown that these can indeed be effective in reducing work stress and fatigue. However, there is some evidence showing that performance decreases immediately after such very short breaks, suggesting that they do not lead to complete recovery. In conclusion, this research shows that taking breaks during the work day may help in recovering from work effort, leading to lower accident rates, lower stress levels, better mood and better performance. Taking a nap during these breaks may further improve recovery, as might drinking a caffeinated beverage. These beneficial effects especially apply to self-scheduled and to longer breaks: very short breaks do not lead to better performance – but they may improve your mood, which is also something to consider. Audrey Hepburn, the movie star of the 1950s and 1960s and later goodwill ambassador for UNICEF, allegedly liked to be alone in her apartment during the weekends: she said that doing so allowed her “to refuel”. Although many of us will use our weekends for different activities, these will usually serve the same purpose, namely to refuel or – in our terminology – to recover from work. In doing so, the weekend performs the same function as the evening, the night and vacations. According to Sabine Sonnentag, a German expert in the area of recovery from work, it is important for workers to start their jobs well rested and fully recovered. In her research, workers who felt recovered and energetic in the morning were happier (more engaged) and performed better than other workers. This underlines the need to understand which off-job activities contribute to better recovery. Of course, having a good night’s rest is important. However, other activities during off-job time may also contribute (or hinder) recovery from work. For instance, some of us may use part of their off-job time to prepare or finish work at home. Essentially, this is just a way of working overtime, and it will be clear that there is no restorative value in activities like handling work-related emails, reading or writing reports or making calls with customers from home. The same psycho-physiological systems that were activated at work remain active while at home, meaning that workers simply work longer hours – only at a different location. Indeed, one might even argue that working from home (outside but also during regular working hours) increases the likelihood for workers to experience conflict between the home and work contexts. “Work-home conflict” occurs when the demands in one context are incompatible with those of the other context, making participation in both roles more difficult. Time spent on the job cannot be spent with your partner or children, and vice versa (this is called time-based conflict). After having had a difficult meeting at work, you may still feel stressed at home (strain-based conflict). At work you may boss people around, but at home your partner and children will not accept that sort of behaviour (role-based conflict). Conflicts between the work and home context will affect your functioning and well-being negatively, and it is likely that such conflicts will occur more often when “work” and “home” are not separated spatially – as when you work from home, in the evenings or during weekends, when your family is around as well. Thus, working from home in the evening or during weekends is a bad idea when it comes to recovering from work. Apart from sleep and work, workers may also engage in other activities during off-job time. In a series of diary studies (where workers complete detailed diaries during a number of days, documenting their activities, feelings, performance, et cetera), Sonnentag found that engaging in household and other domestic activities (such as child care) was largely unrelated to recovery, perhaps because these broad categories comprise activities that are energy depleting (doing the laundry) as well as activities with a high potential for recovery (reading your child a bedtime story or walking the dog). Passive leisure activities (such as watching TV or reading a novel) appear to have a modest potential for recovery. Finally, most studies in this area have found that engaging in active leisure and social activities (such as physical exercise and sports, attending cultural events, meeting with friends) during evenings and weekends is associated with a high potential for recovery, as evidenced by higher levels of well-being and lower levels of fatigue in the morning. As a relatively long and uninterrupted period away from work, vacations may hold a large potential for recovery from work. To test this idea, Jessica de Bloom and her colleagues from Nijmegen University conducted a diary study on the effects of having a one-week winter sports vacation on recovery. Participants were recruited through contacting travel agencies and visiting a winter sports fair. They were contacted five times during a 7-week period; two times before, during, and 1, 2 and 4 weeks after their vacation, respectively. No less than 60 per cent of the participants reported a substantial increase in health and well-being during and after their vacation. Unexpectedly, a small group experienced no effect (23 per cent) or even a negative effect of vacation (17 per cent). This was especially so for participants who derived relatively little pleasure from their winter sports activities or who had experienced a negative event during their holiday – for example, getting injured. This study is interesting, as it shows that whereas taking a vacation can indeed be an effective means of recovery, it is also important how people perceive their vacation: was it a pleasurable experience or not? Quite understandably, recovery will be stronger in the first case. Finally, the beneficial effects of having a vacation should not be overestimated. In the study by De Bloom and colleagues, levels of health and well-being had generally returned to pre-vacation levels during the first week of work resumption. These findings agree with those of other research on the potential of holidays for recovery from work. In conclusion, research on the effects of recovery from work outside working hours has shown that evenings, weekends and vacations all have potential for recovery from work. The nature of the activities in which people engage is important: working from home during off-job time does not help in recovering from work, whereas engaging in active (and to some degree passive) leisure activities has much more beneficial effects on worker’s health and well-being. 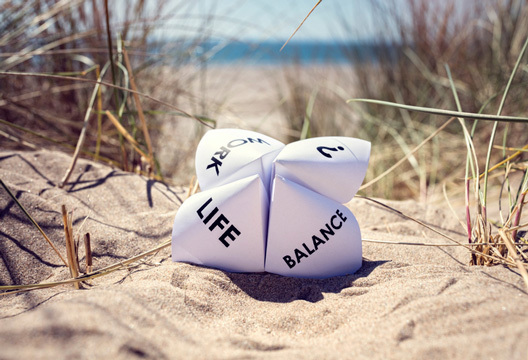 Taking a vacation is a good idea as well; beneficial effects can already be expected for a brief one-week holiday, although these effects do not seem to last very long. Although the literature on working times, recovery, health and well-being is large and complex, the general insights obtained from this literature mesh well with the recommendations given in the Bible, in the Quran and by Julius Caesar. Use that seventh day for rest and, if that appeals to you, for going to church: engaging in social activities is good for recovery. Alternatively, play a game of rugby with your friends or take a long walk with the dog. The evening and night are excellent opportunities to rest indeed. Taking a break every now and then during your work helps in restoring your energy levels. Scientific research has supported and refined these ideas. We now know that working long hours – beyond 8 hours a day or so – tends to result in higher accident rates, lower well-being and stagnating productivity. Workers can recover both during and after work. During work, taking very short breaks will largely be ineffective but longer breaks will help maintaining well-being and productivity. After work, engaging in active leisure activities will help you recovering from work, whereas working overtime will not. Taking a long vacation is fine, but in terms of its effects on recovery, a one-week holiday will probably be equally effective. And do not expect miracles – the effects of a vacation wear off fairly soon. The take-home message here is that organizations should offer their employees opportunities to maintain a healthy balance between effort and recovery; in turn, employees are well-advised to use these opportunities to the fullest. - Toon Taris is Professor of Work and Organisational Psychology at Utrecht University in the Netherlands. He has a particular interest in worker stress and health.